Tokyo Dome (東京ドーム Tōkyō Dōmu) is a 55,000-seat (actual capacity of 42,000) baseball stadium located in Bunkyo Ward of Tokyo, Japan. The stadium opened for business on March 17, 1988. It was built on the site of the Velodrome which was next door to the site of the predecessor ballpark, Kōrakuen Stadium. Like Kōrakuen, the Dome hosts the Toei Superheroes live shows of the year. Tokyo Dome's original nickname was "The Big Egg", with some calling it the "Tokyo Big Egg". Its dome-shaped roof is an air-supported structure, a flexible membrane held up by slightly pressurizing the inside of the stadium. It is the home field of the Yomiuri Giants baseball team, and has also hosted basketball, American football and association football games, as well as puroresu (pro-wrestling) matches, mixed martial arts events, kickboxing events, monster truck races, and music concerts. It is also the location of the Japanese Baseball Hall of Fame which chronicles the history of baseball in Japan. 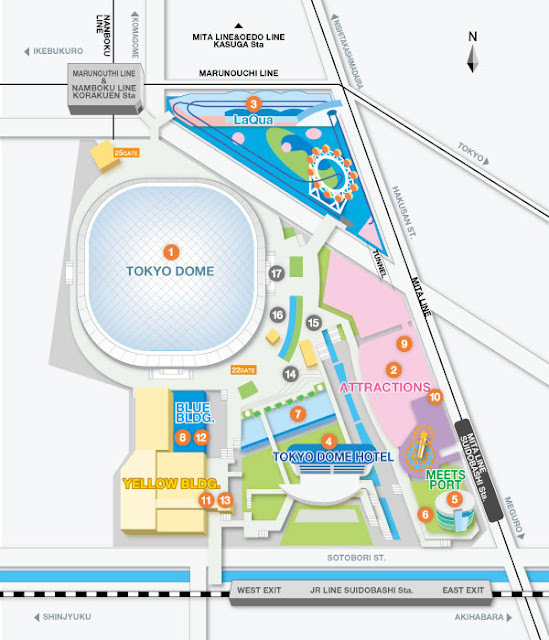 and on the 'city' itself...Tokyo Dome City (formerly known as Big Egg City prior to January 1, 2000) is an entertainment complex in Bunkyo, Tokyo, Japan. It includes the world's largest roofed baseball stadium known as Tokyo Dome (nicknamed "Big Egg"), an amusement park known as Tokyo Dome City Attractions (formerly Kōrakuen Yūenchi), and Korakuen Hall. In May 2003, a spa resort known as LaQua opened for business near Tokyo Dome City Attractions. It also hosts character shows for the Super Sentai series. The Tokyo Dome City contains the Tokyo Dome Hotel, a 43-story hotel that is easily visible from the street and from the Tokyo Subway Suidobashi Station, which is only two blocks away.